Hazen RM, Hummer DR, Hystad G, Downs RT, Golden JJ (2015) Carbon mineral ecology: Predicting the undiscovered minerals of carbon. American Mineralogist, available here. 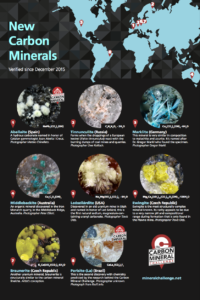 The 8 new carbon minerals verified since December 2015.